Wesley Homes selects new administrator for the next chapter of its Auburn campus. 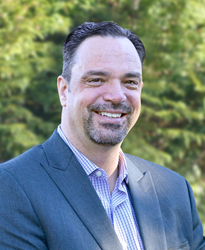 Wesley Homes Retirement Communities and Home Health Services welcomes Greg Byrge as the new executive director for Wesley Homes Lea Hill in Auburn, Washington. As executive director, Byrge will oversee the 19-acre retirement community. The campus consists of Eby Lodge, the main apartment building; multiple independent living residences known as Village Homes; two condo-style Brownstone buildings; housing with services apartments; and The Arbor memory care apartments. Byrge will also be responsible for the newly built Wesley Homes Lea Hill Rehabilitation & Care Center on the campus. During his tour of the Lea Hill campus, Byrge was pleased by how he was welcomed by the community. Byrge is a Licensed Nursing Home Administrator in Washington and Texas and is a Certified Health Care Administrator. He is a member of the American College of Health Care Administrators with over 16 years of experience in post-acute and aging services. With a desire to improve the service quality for retirement communities nationwide, Byrge began a career in administrative consulting. He attended a convention where he met Wesley Homes Vice President of Marketing and Development Christine Tremain, who introduced Byge to Wesley Homes President and CEO Kevin Anderson. “I was impressed by how much Kevin really believes in the vision for the level of care and comfort provided by Wesley Homes communities,” said Byrge. Anderson is equally impressed by Byrge. Before starting his career in senior services, Byrge joined the military as an U.S. Navy Operation Specialist, Air Directional Controller stationed in Long Beach, California. In 1992, he earned a Bachelor of Arts in Communications. His first job after the Navy was as an admissions and marketing coordinator at a skilled nursing facility. Shortly after beginning his career in long-term care, he managed a 134-bed nursing facility in Tennessee where he was promoted to regional vice president for five campuses. Established in 1944 and affiliated with the Pacific Northwest Conference of the United Methodist Church, Wesley Homes operates two retirement communities - Wesley Homes Des Moines and Wesley Homes Lea Hill - and a home health agency - Wesley Homes Community Health Services.